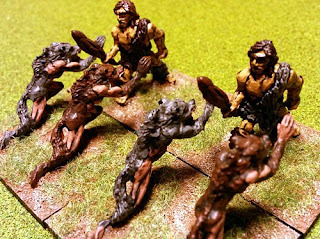 In the classic Barking Irons magazine Issue 1 Steve Hazuka the creator of AoMaS wrote an article about using Heroes, Monsters and Special Units in AoMaS. In this next article I'd like to expand on the use of Monster stands and provide some 'house' rules that I use in my games of AoMaS which I have played and tested. 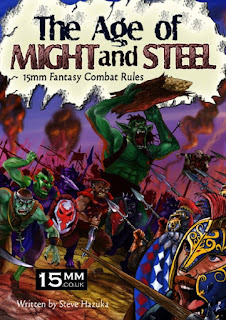 15mm.co.uk provide an excellent variety of monsters in their HOT 15mm Fantasy Range and Tabletop classic ranges and one of the big advantages of using 15mm scale figures is that it is relatively cheap to acquire and easy to store a large collection of Monsters to use in your games. They are also great fun to paint as the only limit is your imagination! As most Monsters can be used for several different armies they are very useful but sometimes it's fun to theme them to a certain army. 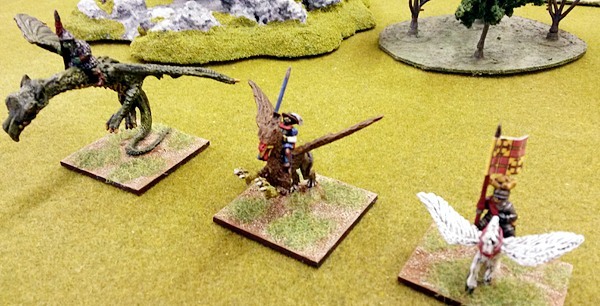 Those of you who have read the article about my human army will know that I mounted human figures on a Griffon and a Pegasus to tie them into the army. Of course you could then use these stands as your general or a hero if you want them to stand out on the battlefield. To see previous articles please click HERE. In the AoMaS rulebook natural creatures includes Giants, Eagles, Mammoths, Elephants, Rhinosaurs, Owl Bears, Ogres, Trolls, Golem, Animal packs, Wyvern, Giant Animals (Spiders, Bats, Slugs etc), Dracci Lords and Giant Lizardmen. 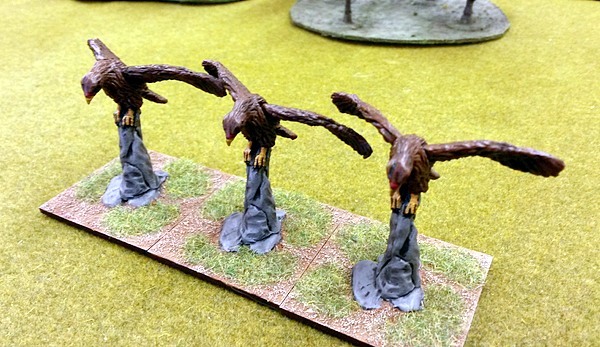 The basic cost of these is 35 points a stand and they can be put with any army that their alignment allows. They are very useful to simply attach to your units to increase the number of stands. 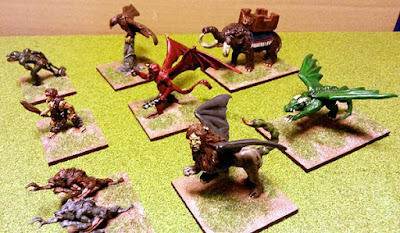 In the AoMaS rulebook magical creatures includes Giant Hydra, Chimera, Manticores, Griffons, Cadaver Giants, Were Creatures, Demons, Pegasus, Skeletal Behemoths, Ents, Giant Elementals and Cockatrice (It also includes Dragons but I'll talk about them separately). These can also be put with any army their alignment allows. On page 25 of the AoMaS rulebook it states that these are also 35 points each but in Steve Hazuka's article he said that with the exception of Were Creatures the cost of Magical Creatures should be 50 points. This is because the majority of Magical Creatures have special abilities and are more valuable in game terms. For example when a Pegasus is added to a unit, it increases that units movement by half so can make sure that unit gets to where you want it to go much quicker than your opponent expects. Using this system, any creature can be made magical and given an ability. If your opponent agrees a Giant could be painted as a Frost Giant and given a magical attack (which deducts 1 from their base number when attacking), for the cost of another 15 points. If you do this I would only use abilities that match a spell on page 17 of the rulebook so that they fit in with the game and are comparable to existing magical creatures in the rules. 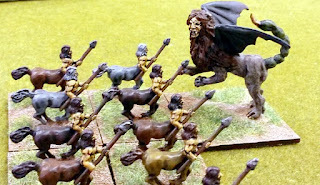 These are another Magical Creature and the most powerful Monster in the game which is why they can generally only be added if 2 armies are fielded on each side (The Dracci can field 1 per army). They cost 100 points each but as well as being able to fly they have a permanent Fright spell which removes an attackers charge bonus, and a magical attack which deducts 1 from their Base Number when attacking. They are worth the additional cost. The points system for Monsters in AoMaS is very simple and the fact that each Monster counts as a stand makes them easy to use so it works. Sometimes though I like to change this so that Monsters play a bigger role in my games. According to their size my Monsters are all based on 40 x 30mm, 40 x 40mm or 40 x 60mm stands. Those based on 40 x 30 count as 1 stand, those based on 40 x 40 cost an additional 15 points and count as 2 stands, and those based on 40 x 60 cost an additional 30 points and count as 3 stands. This system is used for Natural and Magical creatures and gives bigger creatures more punch but at a cost. 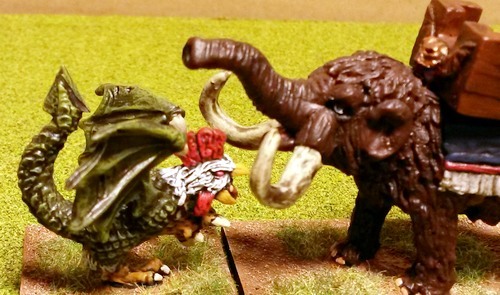 It means that a giant on a 40 x 60 stand is more likely to beat a troll on a 40 x 30 stand in single combat due to the 2:1 outnumbering rule which I like. It also means that a large '3 stand' monster can really boost the number of stands when attached to a unit. Be careful of the 12 stand maximum for units though. 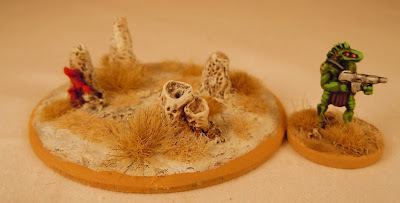 As my Dragons are based on 40 x 60 bases this makes them cost 130 points and even more powerful but as they are rare it hasn't made a huge impact on my games. Other monsters on 40 x 60 stands have just as much chance of beating them as they did before. The only down side of this is that the monsters need to have damage recorded but I do this with a small dice sat on their base avoiding any record keeping. A '3 stand' monster that takes a point of damage then effectively becomes a '2 stand' monster to reflect the effect that the injury has on it's fighting ability. 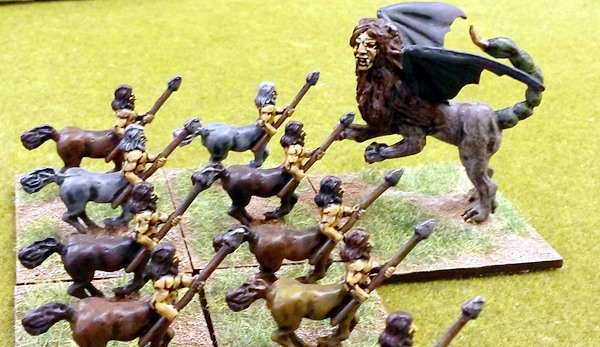 It's sometimes fun to use monsters to represent units in your armies. 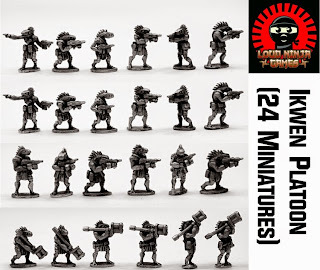 As an example Ogres could simply be used as allied heavy infantry to represent mercenaries in a human army. I have a unit of 9 Trolls each on a 40 x 30 stand that I use with the stats of heavy cavalry to add punch to my Goblin army, if my opponent is happy to allow it. The Goblin army doesn't allow heavy cavalry in the main rules so this is fun to do as it changes the tactical options of the Goblin army as well as those of the opposing army. Using the alternate rules about base sizes you can also make units from bigger Monsters. I have 3 Eagle figures each based on a 40 x 40 stand (which then equates to 6 stands) and I give them the stats of 6 stands of light cavalry to give an army a different look. They work particularly well with Elves guarding their woodland realm. If you want to be more conventional, you could use the rules for allies which gives a maximum number of 8 stands for the monster unit, plus a character. 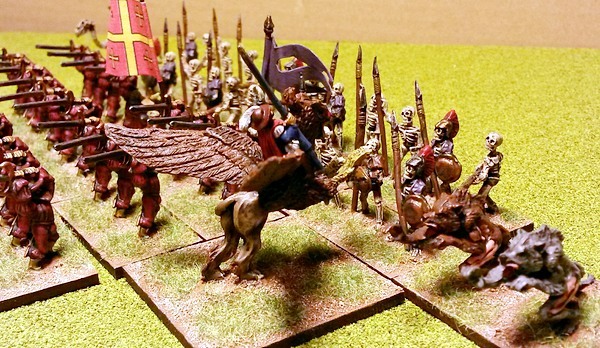 A unit of centaurs could easily be used as allied cavalry for most armies but why not substitute something different using the same stats! Using monsters and magic is often what attracts us to fantasy games and I hope that this article has got you to think about how you use monsters in your scenarios. I also hope that it's given you a good excuse to paint some extra figures and take advantage of the great offers that 15mm.co.uk do when you purchase multiple packs. You can choose to buy a pack or three packs with a saving or even samples. Excellent. Wally paints up the Ikwen! 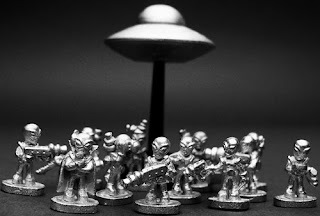 I was kindly given permission to post up these two photographs from the collection of Wally Harwood who is a customer of 15mm.co.uk and a fan of the Iwken, the alien race created by Eli Arndt at Loud Ninja Games which we stock. I hope you enjoy them. I certainly do and I really like that green colouration. A very original idea you can read about the origins of the Ikwen on our blog HERE. If you want to see all of the posts including release ones this specialised blog search will show you them HERE. There are three packs of Ikwen and a great platoon saver deal too. There are also specialised terrain items for the Ikwen all of which can be seen on our website HERE. Perfect for use as an indigenous alien foe for your space faring forces or as alien guerrillas fighting a heroic resistance against say Human occupation of their world. New Deals and Offers for July 2016! All of us at 15mm.co.uk are delighted to announce our Deals and Offers for July 2016 are now online. Go along to our offers page HERE to see them all and read on below for highlights from the page. These limited time offers are around until the end of the month when they will be taken down. They can be ordered any number of times and can be purchased in conjunction with any loyalty code you have or offer in your packages from us. 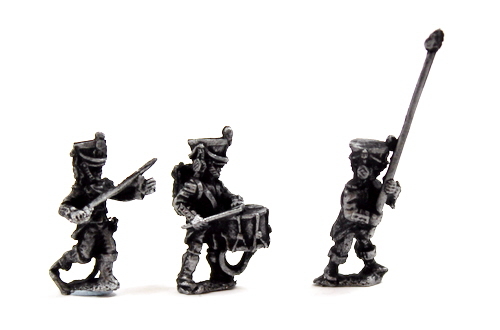 If you are a wargamer who plays 15mm Fantasy, 15mm Science Fiction or 15mm Napoleonic French we have something for you! 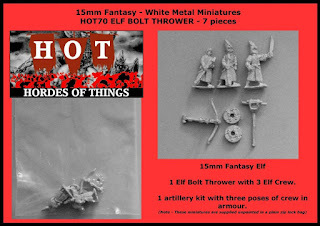 HOT70 Elf Bolt Thrower 25% off! 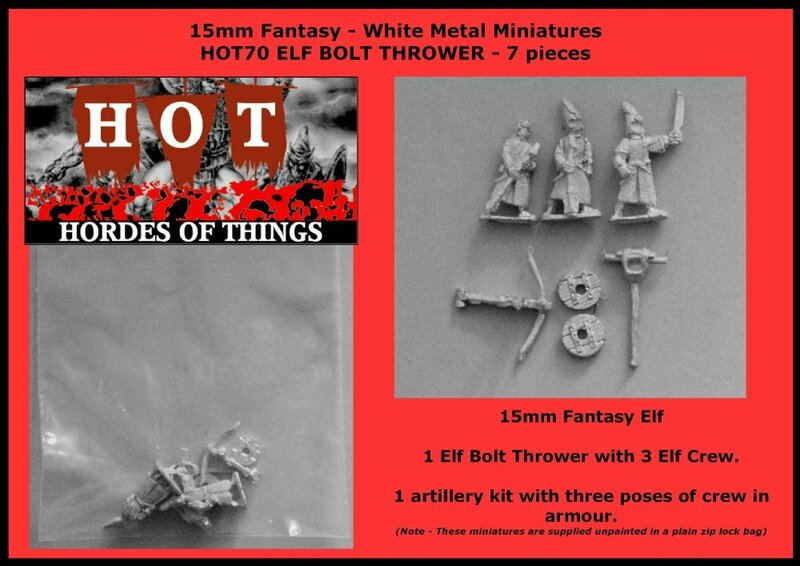 This code contains white metal 15mm scale miniatures in the following poses: Bolt Thrower kit with wheels, Elf Crew with Bolt in helm, Elf Crew with Bolt, Elf Officer with Sword. Excellent for any Elf army in 15mm wargaming in need of artillery support. HOF51 Grey Alien Landing Party 25% off! Contains 12 Greys in twelve poses and a resin Flying Saucer kit. The initial landing force of the Greys. This pack contains one of each grey and the saucer from codes HOF47-50. White Metal and Resin. Grey Aliens are an enigmatic race of small, bulbous-headed, and highly intelligent aliens, the Greys are primarily scientists rather than soldiers, but sometimes come into conflict with other races when competing for resources, or when seeking to establish possession of a particular site for temporary and mysterious purposes. Their unauthorised experimental activities on live subjects who have usually been abducted can also provoke a hostile military response from races who have been subjected to such intrusions. 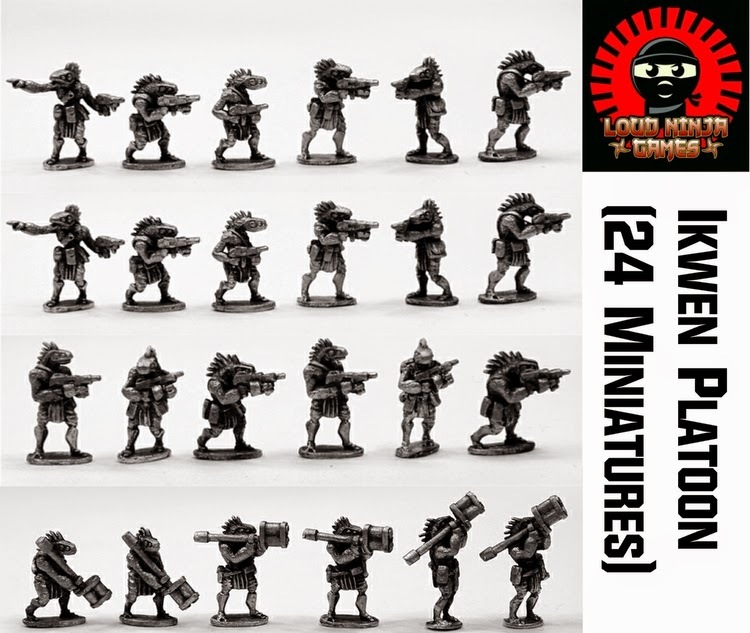 25% off core 15mm French Line Poses! We have a huge range of 15mm scale classic Napoleonic miniatures formally of the Tabletop Games line up and among them is the massive French Army the primary army of the period. We have taken a quarter off four codes giving you the chance to form a line battalion with a saving. As singles or small sets they are as follows: F100 French Voltiguer Firing, F101 French Fusilier Advancing, F109 French Grenadier Advancing and F106 French Line Command (3) set. Enjoy! For all these and more go HERE. 15mm.co.uk will have more news this month including a new designer in the SHM Range with some rather triffic miniatures. This news will appear across the month with further information and images.